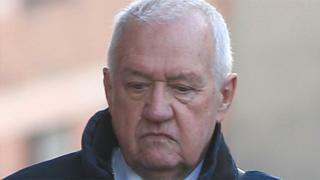 Hillsborough match commander David Duckenfield has been treated as a "target of blame", a jury has heard. Continuing his closing speech for the defence, Benjamin Myers QC said evidence from the 2015 Hillsborough inquests should be dismissed. He told Preston Crown Court the 74-year-old was an "excellent police officer". The retired chief superintendant denies the gross negligence manslaughter of 95 Liverpool fans who died in April 1989. Mr Myers told the jury: "David Duckenfield has not been treated as a normal person, but as a target of blame. "We suggest the human compulsion to find someone to blame when something goes wrong is very powerful." He said Mr Duckenfield "went to work that day to help people" and accused the prosecution of relying heavily on evidence from the inquests in Warrington. The court heard that, during those hearings, Mr Duckenfield admitted several failures and accepted he froze as the disaster unfolded. Mr Myers said many of the answers were given in hindsight and taken out of context. He argued Mr Duckenfield had been subjected to intense scrutiny over seven days in the witness box. "What you have," he said, "is the relentless questioning of a man struggling to recall what he knows and what he doesn't, until it seems he ends up accepting some of it. "For the prosecution to use it in this way is very unfair. Ultimately we dismiss this evidence." On Friday Mr Myer said the prosecution of his client was "breathtakingly unfair" and the jury was being invited to "give him criminal responsibility for a decade of incompetence on the part of others". On Thursday, prosecutor Richard Matthews QC said Mr Duckenfield had "ultimate responsibility" and should have made "lifesaving decisions".